Stylish Black – Don’t be Afraid of the Dark! Don’t fight the dark this winter, embrace all that is black. Black furniture and decor can create a fabulously stylish, chic look, moody and atmospheric. Black doesn’t have to mean depressing and scary, it can mean cosy, think dark rooms and burning log fires, dark black skies alight with sparkling stars. Below is a medley of stylish black furniture from Chichi Furniture to create that chic look in your home. Welcome to Friday, another week successfully done and today Chichi Furniture is embracing the dark. Sometimes when the weather turns and the winter is on the way, we quickly get the paint out, turn on lights and try to lighten and brighten our homes to hang onto the summer as long as we can. Well, it can be tiring fighting against the inevitable, so today we are taking a different slant and embracing the dark and all that is storm clouds and winter. One of the charms of the winter is actually cosying up, lighting fires and candles and shutting curtains. Choosing black furniture not only looks stylish and chic, but can create a very intimate and atmospheric ambience. Take a look at the below fabulous pieces from Chichi Furniture to create a similar vibe in your home. When it comes to our bedrooms, we often think/need them to be tranquil havens, somewhere we can go to relax and wind down from the day. But, we still want them to be stylish and inviting. Its hard to actually feel restful in a lackluster, disorganized space. Today’s bedroom theme is ‘black’, which people don’t necessarily think of when it comes to relaxing. Often when it comes to bedrooms we choose light, bright colours to make the rooms feel bigger and calming. But actually black can create a striking bold space. Get it right and its super stylish and chic. You can go all out black for that darker/cosy end result, or contrast black furniture with lighter walls, or add some golds/silvers or pops of bright colour to create a stunning feature room. Playing around with texture and furniture style can also dramatically affect the rooms final look. Below I have shown 3 different examples of ‘black’ bedroom furniture from Chichi. 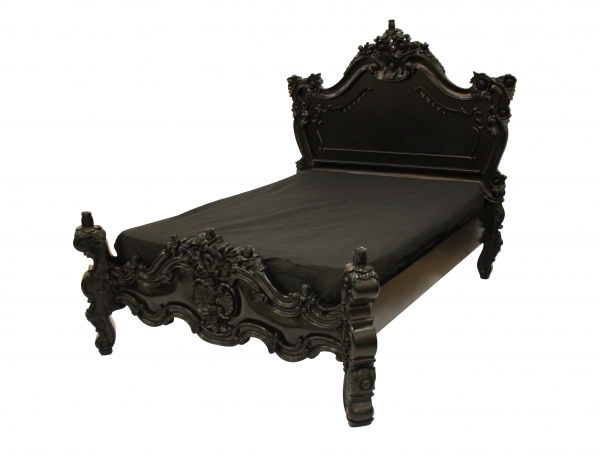 The first being very strong, heavily carved, gothic style, ideal for creating that cosy space – add some mood lighting and the room will simply beckon you in. The second is a much more understated chic look with straighter edged more contemporary French style pieces, a great set to have against lighter walls for that striking contrast. The third is something in between, it boasts some carved detailing and elegant shape highlighted by gorgeous gold leaf to ensure the furniture is the talking point of the room. A striking visual without looking too heavy. Can’t believe its Friday again and I can’t believe we’ve nearly reached the end of our A-Z, in fact I’m in a predicament because i’ve been dreading reaching X, so I think this weekend I will have to give serious thought to that one as its next in line!! Luckily today is ‘W’ and ‘W’ is for Wardrobes. Wardrobes are vital, not only to help with the obvious storing of our clothes, but also they are big units that can really complete a bedroom design or ruin it if you get it wrong. They are bold features so you want them to complete a scheme and not look out of place. Think about whether or not you want your furniture to blend into a scheme or contrast and stand out against it. Look at the colours you’ve chosen and accessorize throughout to continue the colour through the room so everything flows. Decide whether you want one main feature or a group of items working together. For instance, if you have a large black bed, you may choose a large black wardrobe with gold trim, then you can add other gold items throughout the room such as cushions on bed or a stunning gold framed chair in the corner, this will then tie all the pieces together. Think about texture too, a black bed with rattan headboard will appear softer than solid wood. A wardrobe with mirrored doors will be less imposing than solid wood.